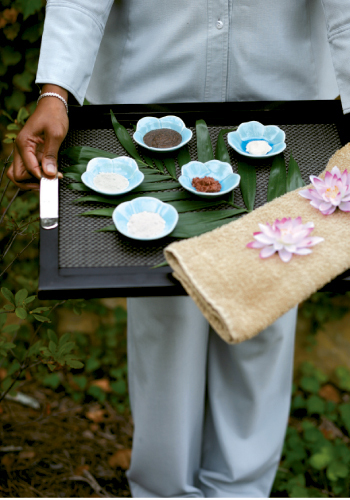 The spa’s Japanese Tea Ritual pedicure— with special products such as nut- and green-tea rubs presented in ceramic lotus bowls—is a unique pleasure not to be missed. 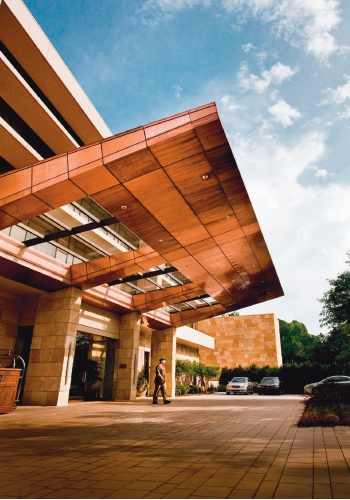 With its handsome façade and bellman at the ready, The Umstead is the picture of luxury. 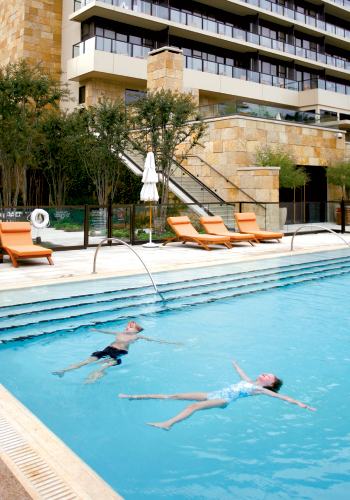 Luckily, it’s also family-friendly, with a pool that invites guests to float the day away. 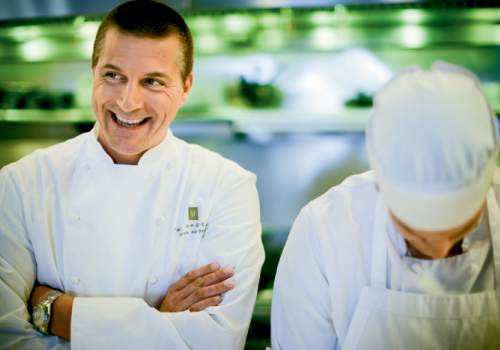 With celeb chef Scott Crawford as top toque at Heron’s, the culinary scene at The Umstead is as exciting as the property. The restaurant was designed as a place equally suitable for power brokers meeting for breakfast and foodies dining at night. Lee and Lizzie lounged in a private poolside cabana—complete with flat-screen TV—sipping fresh fruit smoothies. With only a three-day getaway available on my vacation calendar, my goal was to combine a little personal R&R and a lot of family time with my Raleigh grandchildren. My strategy: we’d share my mini vacay in luxury accommodations where we’d have all the pleasures of time spent together and none of the hassles—no cooking, no cleaning. I call it a visit from grandmother, reinvented. Although it’s the state capital and part of North Carolina’s prosperous Research Triangle, until recently Raleigh was rather short on luxury lodging. Searching the web, however, I found in neighboring Cary The Umstead Hotel and Spa, which had commanded Mobile Four Star and AAA Five Diamond ratings within a year of opening its doors in 2007. Photographs radiated an aura of pampering and peacefulness, and considering that it’s set amidst 12 acres of privacy, six short minutes from the airport, and on my family’s side of town, The Umstead seemed like the perfect solution. Would this pristine property, the choice of the Triangle’s high-powered business clientele, welcome tiny travelers? A quick conversation with one of the charming concierges allayed my concerns. 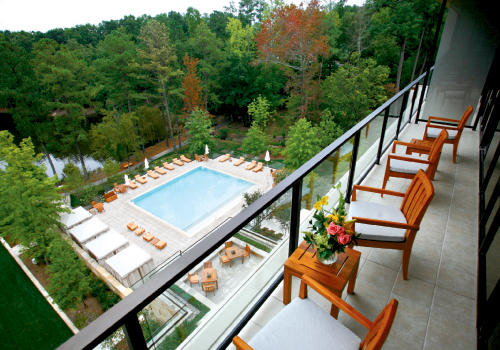 With an infinity pool, nature paths around a three-acre lake, bikes to ride the trails of the nearby Umstead State Park, and Wii and PlayStation 3 hook-ups in our room, there were plenty of family-friendly activities available. 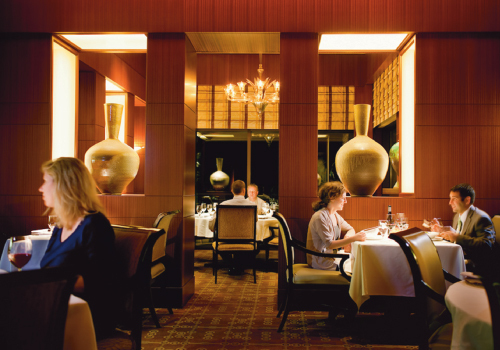 Just off the beltway but light years away in ambiance, The Umstead proved to be a posh destination. Designed by the Dallas firm Three Architecture from rough-cut limestone, aluminum metal panels, and bronze-colored glass, the hotel rises six stories above a lovely lake. In the interior, South American caramel-hued anigre wood is coupled with an art collection of more than 1,000 works, crowned center stage by a Dale Chihuly sculpture of clear glass flower bulbs straining skyward from a moss-covered table. Arriving late on a Friday after-work flight, the oasis of calm ushered me in. 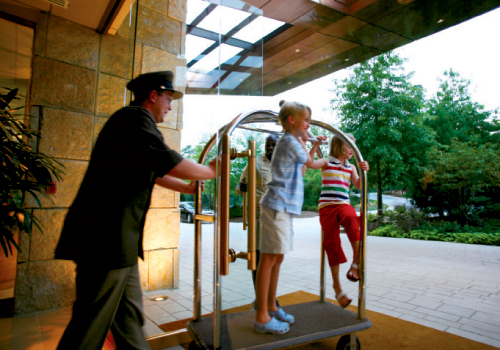 Smooth as silk from arrival to departure, The Umstead’s level of service is exemplified by the second elevator system that silently whisked my bellman and luggage to my door, separating me from cart and chitchat. A pre-ordered light supper of fresh fruit and cheese was ready as requested, permitting me the leisure of a long bath in the extra-spacious soaking tub and early slumber in my eiderdown-soft bed. At night, my room seemed masculine and modern, but the morning sunlight through its floor-to-ceiling glass windows warmed the walls to the palest shade of gold, reflected in the rich drapes and duvet. I extended my renewal time with breakfast in bed, which arrived elegantly presented on a handsome tray of heavy hotel silver, with a silver vase for the calla lily and a silver dome. The food was of equal quality: barista-fresh coffee and to-die-for steel-cut oatmeal topped with tourned bananas and bruléed sugar. A Japanese Tea Ritual pedicure was another item on my Saturday “me menu,” so I headed for The Umstead Spa, a 14,000-square-foot Zen space of beige and sea-foam green coolness with a soothing water-wall cascade, fountain, and vista of the pool. 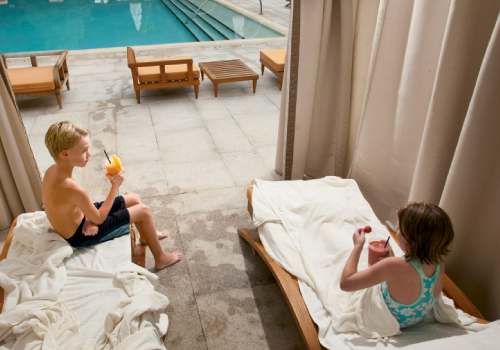 A serene sanctuary dressed in Oriental overtones, with 10 treatment rooms, wet and dry lounges, couples suites, fitness studio, nail salon, and outdoor meditation garden, the spa offers ne plus ultra spend-the-day possibilities. My pedi, which came with a bamboo tray of ceramic lotus bowls filled with nut rub and green-tea rub, and an accompanying rose, camellia, and plum hydrating mist, was lovely to see, smell, and feel on the tootsies. I had just changed into my swimsuit and caftan when the concierge rang to say that my grandchildren, Lee and Lizzie, had arrived. First stop: the selection of PlayStation games for our evening entertainment. Then off to the pool, where our Hollywood-style cabana, complete with teak chaise lounges, stacks of plush cream-colored towels, and a flat-screen cable television, faced the pool and woods beyond. We swam, lolled on our chaises watching the Food Network, and ordered crab cakes and cream-cheese ice cream from the indoor pool bar. This must cost a million dollars, the children decided, and indeed, we felt like royalty. Soon it was time for room service. If you let kids select their dinner from the menu and order it themselves, the smiles on their faces when the white tablecloth-covered trolley rolls through the door tell you how wondrous a pleasure it can be. Their burgers and fries thrilled them every bit as much as my truffled crab salad did me; their simple chocolate cupcakes garnished with sprinkles were as delightful as my gorgeous goat cheese cheesecake with honey-roasted apricots and Riesling granité. We finished our day together with a movie, PlayStation, and a rousing round of Old Maid. Past experience at their parents’ annual Pawleys Island beach week had taught me that a night with the three of us sharing a room tended to be a late one filled with giggles, so I packed them off to their mom and dad at nine, plumped my mountain of pillows, and settled in with a movie I’d missed at the theater. I started my Sunday with pure indulgence—brunch at Heron’s, The Umstead’s chic restaurant and bar complete with stunning sculpture, fine china, and Riedel Sommelier stemware. The ownership wisely recruited former Cloister’s Georgian Room chef Scott Crawford to take the hotel’s culinary helm. As a result, the sum total of Heron’s setting and cuisine is the epitome of style and sophistication. The scene of weekday power breakfasts and see-and-be-seen dinners, Heron’s slows for Sunday brunch, enjoyed by many at Italian umbrella tables on the terrace. I began with a Sun Sugar tomato gazpacho made with heirloom cucumbers and Sun Sugars from The Umstead’s own garden and sparked by a hint of lemongrass. A succulent roasted halibut followed, colorful with its confit of fork-tender fennel, mélange of cured Italian olives, and piquant sweet pepper relish. My finale of chocolate chess pie by pastry chef Daniel Benjamin was a chocoholic’s dream of creamy confection in an ethereally thin butter crust. The grandchildren left me to my last night of luxury with the dream of a week’s stay at The Umstead next summer and a list of all the things that we could do—if we can tear ourselves away from the hotel.